This article is about the Blade. For the battlemage in the Mages Guild, see Roliand Hanus. 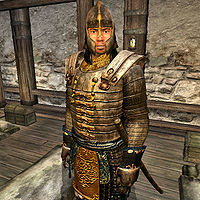 Roliand is a Nord Blade who resides at Cloud Ruler Temple in the Jerall Mountains north of Bruma. He works the night shift and spends the afternoon sleeping in the West Wing until 4pm. After waking up, Roliand heads outside and patrols the grounds, making a sweeping circle around the wall, stopping at the West Watch Tower on each pass. Starting at midnight, he stands guard outside Martin's room in the West Wing until 8am when he grabs a bite to eat in the East Wing before his bedtime at 12pm. The only exception to this routine happens during the Weynon Priory quest, when you arrive at Cloud Ruler Temple with Jauffre and Martin. He will be one of the six blades standing in line in the courtyard, ready to lift his sword and salute his new emperor. Roliand wears a set of Blades armor, missing only the shield. He is armed with an Akaviri katana. When he goes to bed at noon he slips into a more comfortable set of middle-class clothing, a brown shirt and a pair of light brown linens. He carries whatever clothes he is not wearing and a small amount of gold. When asked about Cloud Ruler Temple, he will express his feelings for the place: "Cloud Ruler is many things. Temple, fortress, safe haven. But it's also my home. I'll gladly die defending these walls, if it comes to it."